Did you ever look at a pattern and just fall in love with it?? I’m pretty sure you have. But how do you know whether you’ll be able to tackle the pattern and make it look exactly like the picture – without losing your mind? The generic answer . . . you don’t. 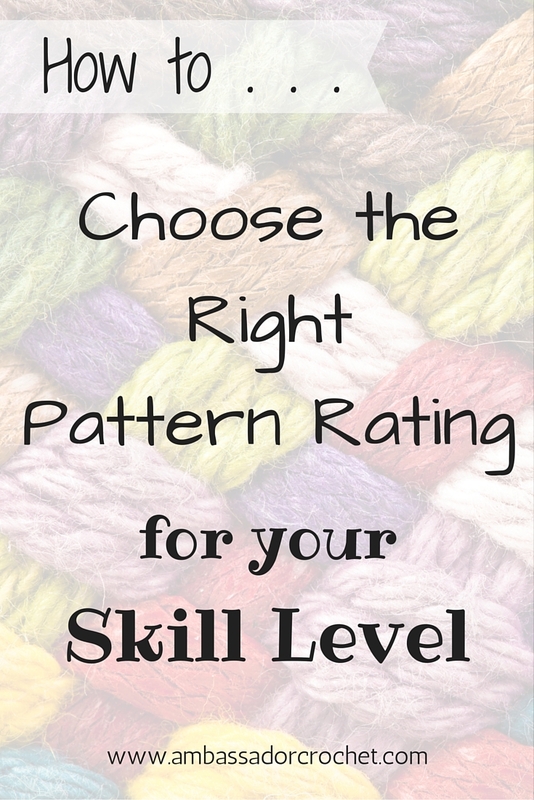 But, buy using the pattern rating system from the Craft Yarn Council, there are some ways to get a better understanding of the pattern and whether or not you should give it a try. While nothing is fool-proof, there are some industry standards that are worth considering. With so many patterns available to crocheters, it may be hard to know which ones will be perfect for you and which ones will frustrate you. To avoid some of the frustration that may happen while working your next project, make sure you are using a pattern that is based on your specific skill level. The guidelines below give you a loose idea of how a pattern is rated. Projects for first time crocheters using basic stitches. Minimal shaping. While beginner patterns are great for everyone, you may not try an experienced pattern for months, possibly even years. As you build your skills, knowledge, and overall experience you will be able to work your way up the difficulty ladder. So how do you know what rating you’re at? If you can do all of the requirements listed in one of the ratings above, then that would be the level you’d be at, and you may be ready to at least give the next level a try. If you can one or two of them, make sure you’re comfortable with the patterns at that rating level before giving the next level a try. I’m one of those people who loves a challenge. The harder something is, or the more I’m told it can’t be done, the more determined I become to figure it out and accomplish it. But that has both good and bad sides to it . . . especially when it comes to crochet patterns. You don’t want to frustrate yourself because you don’t want to end up giving up and not trying that intermediate or experienced pattern the next time. If you think you’re ready to try an advanced pattern, check out this blog post for some tips on How to Tackle an Advanced Crochet Pattern.